A fire has left the future uncertain for a vintage motel on the Lincoln Highway south of Plainfield, Illinois. 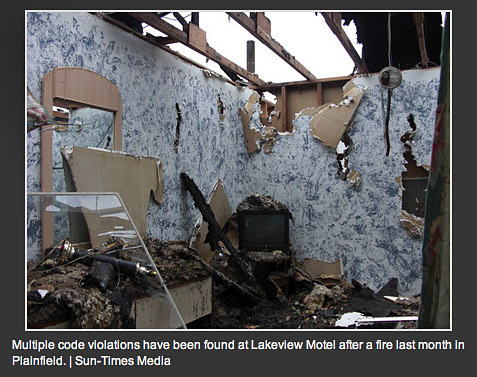 About two thirds of the Lakeview Motel, 15824 S. Joliet Rd. at Renwick Rd., was damaged at a loss estimated at $350,000. 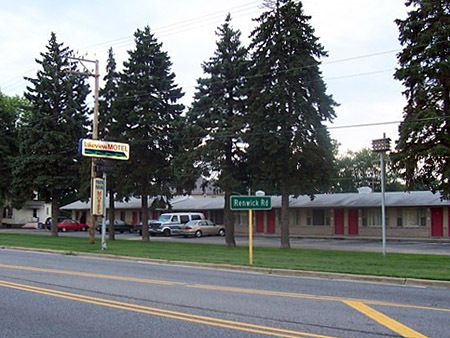 The Plainfield Patch reports police believe the blaze started in an unoccupied room and quickly spread into the roof of the 19-room motel. The longtime maintenance manager thinks an unhappy tenant may have been the source, and said, “Out of 19 rooms, 10 of them are pretty much gone.” A photo the paper ran from before the fire (by Kevin Whaley) shows the c. 1950 motel. This entry was posted on November 1, 2010 at 1:25 pm and is filed under highways, history, Lincoln Highway, lodging, travel. You can follow any responses to this entry through the RSS 2.0 feed. You can leave a response, or trackback from your own site.